Northern Vancouver Island is a treasure trove for off-the-beaten path adventures and outdoor excursions. Packing a lunch, some beach towels and heading to one of the many beaches is a favourite of locals and travellers alike. In this blog post I am going to describe my top three favourite beaches that are accessible from Port Hardy, BC. Let’s start with the easiest to access, but also my all-time favourite spot in town, Storey’s Beach. Located 10 minutes outside of downtown Port Hardy, 3 minutes from the airport and at one end of the very popular, Commuter Trail, Storey’s Beach has something for everyone. The low tides (which happen twice each day) provide a huge, sandy beach that is perfect for all kinds of activities. At the far end of the beach there is a large rock bluff and beyond that there are amazing tidal pools that are accessible at low tide. On calm days the bay is perfect for kayaking, canoeing, paddle boarding and launching small boats. I personally live at Storey’s Beach and go there almost everyday in all types of weather & love it no matter what. Build a sandcastle, pack a picnic or roast some smores over a campfire- Storey’s Beach offers something for everyone! Ok, so this is by far my second favourite beach on Vancouver Island North. This beach trip requires a bit more prep and planning, but is so worth it! From Port Hardy the drive to the San Josef Bay & Cape Scott Provincial Park trail head is about 1.5 hours long. Once you turn off the highway the road is gravel (with varying conditions) and has active logging traffic at most times. There is also no cellular service once you hit the gravel road, so it is good practice to always be prepared with plenty of food, water, emergency supplies and at least one, full-sized spare tire. I know many people who have had one, two and even someone who has had three flat tires on this road, so it is always good to be prepared. An oversize 'fat truck' on the road to Holberg. One hour into the drive you will travel through the small, logging town of Holberg, BC. You must make sure to stop at the iconic, Scarlet Ibis Pub, for a snack, coffee or lunch and say hi to the always fun and knowledgeable owner, Pat. From here it will be another 30 minute drive to the trailhead. The roads are clearly marked, so just keep your eyes peeled for logging trucks, black bears, black-tailed deer and direction signs. 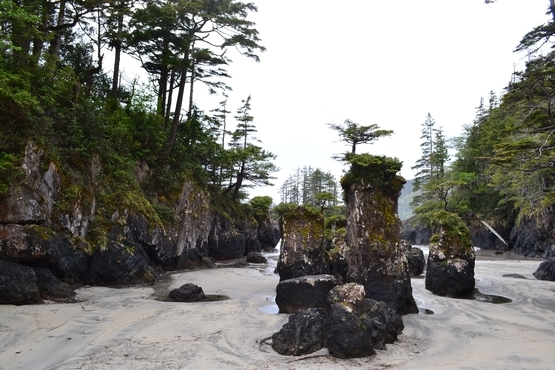 The sea stacks at San Josef Bay in Cape Scott Provincial Park. The trail into San Josef Bay is an easy 45 minute hike on a well-maintained and flat trail. This hike is amazing and feels like something out of a Jurassic Park movie. Be prepared to see some old-growth Western Red Cedar trees that are somewhere around 800 years old. There are also huge old Sitka Spruce trees and Hemlock trees that intertwine with their cedar friends in hug-like embraces. This landscape shows the full life-cycle of our coastal rain forest and has many nurse logs nourishing and providing homes for their younger counterparts. A sea cave at San Josef Bay. At the beach be prepared to be impressed! On the far right side there are sea stacks, sea caves, amazing tidal pools and access to ‘Second Beach’ at low tide (make sure to know the tides before you head over there). On the far left of the beach check out the San Josef River and estuary. Plan on spending at least 2-3 hours at the beach to truly experience all it has to offer. There is also beach camping available at San Josef Bay. Raft Cove is a bit more challenging to access, but is so worth it! The trailhead for Raft Cove is about an hour past Holberg, making it around a two hour drive from Port Hardy. This road is also well-marked and and has active logging traffic on it. The hike into the beach takes about 45-60 minutes and is moderate to strenuous at times. During the winter it can also be very muddy and the occasional blown-down tree may be blocking the marked trail. Arriving at this beach is like walking into a fairytale. The sandy beach is so smooth and pristine and lined with beautiful trees that cover great camping sites. To the far left of the beach is the Mackjack River and beyond that are amazing tidal pools (accessible at low tide) and many more rocky alcoves to explore. In the spring there is also a good chance of spotting Humpback and Grey whales migrating north for the summer. 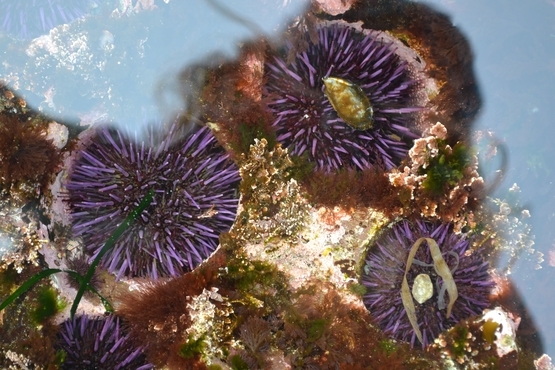 Colourful tidal pool finds at Raft Cove. Well, there you have it. My tips (and suggestions) for exploring some of the best beaches around. Feel free to contact me with any questions about these places or other North Island adventures! We went for an awesome paddle yesterday morning for the ultra low tide. The sky was foggy and the water was glass calm. The .07 ft tide allowed us to see sea cucumbers, anemones, sea stars, moon snails, geoduck clams, dungeness crab, scallops, chiton, bait fish and a sea lion. Contact us to plan a customized stand up paddle board tour of Storey's Beach. Don't get stuck, ride with us! The 60 kilometer drive from Port Hardy to the San Josef Bay & Cape Scott trail head poses many possible risks and frustrations to travelers. 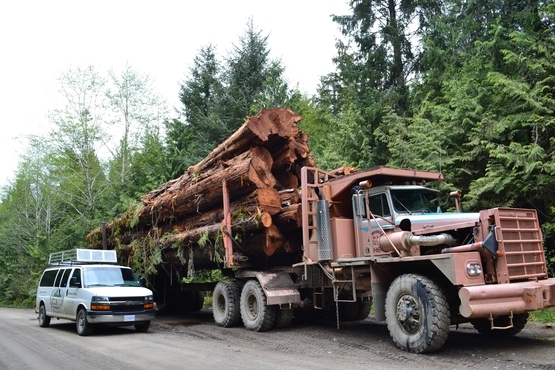 The road is a VERY ACTIVE logging road, and you will likely see multiple oversize and off road "fat trucks" that you are responsible for getting out of the way of. The conditions of the road are always changing, and it is usually riddled with pot holes and large, sharp rocks that are perfect for shredding tires. Locals know that it is always key to carry two or even three spare tires while travelling on these roads. There is also NO cellular or internet reception once you turn onto the gravel road outside of Port Hardy. This poses a huge problem for people who need a tow truck or help. They truck drivers all carry VHF radios in order to warn other vehicles where they are at, and it is recommended for all travelers to carry them and be on the correct channel. Our tour guides are able to alleviate all of these stressful situations for you. We carry a satellite radio, VHF radio, and a two-way GPS messaging device. We have appropriate tires on our van and always travel with multiple spares. We want to show you the amazing & remote locations on northern Vancouver Island without any hassle, stress, or danger. Come with us to enjoy and 'chillax' instead! A typical 'fat truck' beside the Cove Adventure Tours van. Our van and staff are ready to show you the rugged & remote beauty of the north island. Contact us for details or book a trip online! Today was a perfect spring day at Palmerston Beach. It rained on our drive there and back, but the clouds parted for our beach time and we were able to do some serious exploring thanks to an extra low tide. We took a drive to the old Suquash Coal Mine yesterday. It's so full of history and gives visitors an idea of the community that once existed there. The beach is strewn with sandstone and bits of coal along with stunning vistas. The hike in is quick and you are immediately immersed in a tall stand of trees that is littered with bits of historical treasures. In only a couple more minutes you will find yourself on a vast, rocky beach with expansive views of Malcolm Island and the Queen Charlotte Strait. We love exploring and learning about local history- let us know if you want to join us in the future! Grant Bay on a Beautiful Day! We had a great trip to Grant Bay this weekend with an awesome group of people. The weather was perfect, the lunches were very tasty, and we all came home with big smiles on our faces! We highly recommend taking a trip to the Beaver Lake Interpretive trail. It's a very easy walk and offers a glimpse of our local forests at their different life stages. The interpretive signs are very informative and the trail is well maintained. Check it our for yourselves or let us take you there! We are available to take guests wherever they like on northern Vancouver Island and are happy to help you create your own adventure!